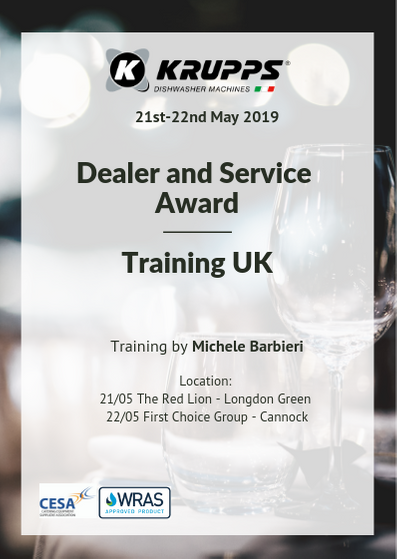 Hosted at First Choice Group’s facilities in Staffordshire, the first UK Dealer and Service Award in concomitance with the 2019 Krupps Training which will run on the 21st May and has been driven by the today success achieved in the UK market. John White House will presenting the Award ceremony. Krupps UK Training began in 2017 and since then, the warewashing equipment manufacturer has been working on developing new avenues to support UK dealers. We provide high-quality training every year in order to grant always our customer a very high after-sales service. Riccardo Scuotto – Export UK – sais: “Krupps is delighted to launch our first UK award event. This new event initiative will award our dealer partners for their hard work. These collaborations have given us the opportunity to achieve a representative position on the UK market and for that reason we want to show appreciation to them with a dinner and award ceremony. In addition we want to provide them with support, information and guidance with training session on the following day as stated in our annual training programme”. We strongly believe the importance of supporting our worldwide partners and dealers, and these events are the perfect way to ensure this.